Summer 2018, with the help of many generous donors, we brought two World War II Veterans – one British and one German – who took part in the fierce fighting in Tunisia 75 years ago, and who are now best friends, together again. Their moving reunion was filmed for a mini-documentary for the public and for students learning about World War II. No longer enemies, Graham and Charley have become as close as brothers. Their friendship is deeply rooted in honor and respect, and demonstrates peace in action. 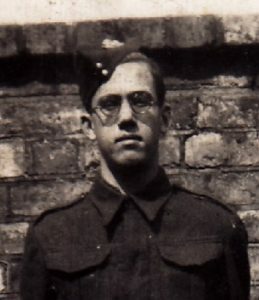 Desert Rat Graham Stevenson, 93, fought in the desert from ages 17 – 19 in Grant and Sherman tanks at El Alamein, the Mareth Line, and Tunis as a part of the Sherwood Rangers Yeomanry Tank Regiment. In late June 1944, he came in on Gold Beach and was severely wounded by German machine gun fire on his first day o f hedgerow fighting in Normandy. 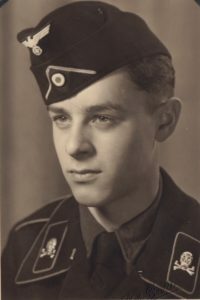 Africa Corps Panzermann Charley Koenig, 94, served in a Panzer IV long-barrel tank crew fighting the British and Americans at the Mareth Line, in the mountains at Medjez-el-Bab, and around Mateur-Ferryville. He was taken as a POW from Africa to the U.S., Belgium, and then England. In 1991 he sought out the Sherwood Rangers, who became the best friends of his life and welcomed him as a brother into their Old Comrades’ Association. Graham and Charley have been heartfelt friends for over a decade.